Robert Nesta Marley born February 6, 1945 in Nine Miles, St. Ann Jamaica, transcended the humility of his rural beginnings to become a million-selling artisit and entertainer whose pleas for brotherhood, justice and peace achieved international fame. At the young age of 16 he started singing professionally, releasing his first single "Judge Not". Under the coaching of Joe Higgs, Bob Marley met two other youngsters Bunny Livingstone & Peter Tosh and together the Wailing Wailers group was formed in 1963. It was the time when "SKA", the hot new dance floor music with a definite back-beat was popular. "Bob Marley and The Wailers". 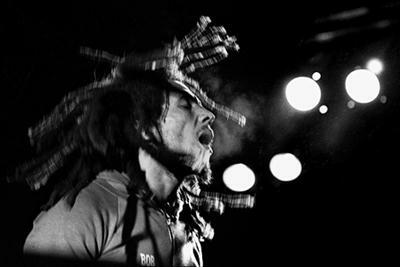 Bob Marley - the first superstar from the Third world was one of the most charismatic performers of our time. 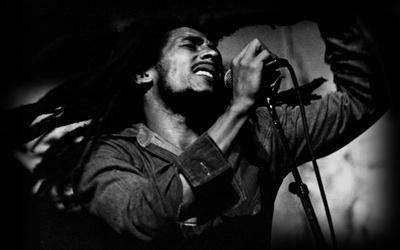 He gave the world Reggae Music, sold several millions of records worldwide and died at the young age of 36. His legacy lives on in his children and the many artistes continuing to strive to bring Reggae music back to its roots. More on The Bob Marley story here.